This workshop provides a forum for young composers to refine their compositions, explore new ideas, work with performers and hear their music played by great players in amazing venues. Kamran İnce and Marc Mellitshave each been described as post-minimalists, and are certainly two of the most exciting and successful composers of their generation. 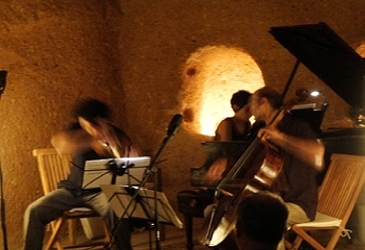 They will share their insights and experience through private lessons, colloquiums on extended techniques with performers, and will lead open rehearsals of their own works as well as the new compositions emerging from the participating composers. Participants will have the opportunity to meet and work with dedicated performers of new music. Composers will also get a chance to delve into the rich traditions of Turkish classical and folk music. Michael Ellison, a Fulbright recipient, began his time in Turkey researching ethnic styles and has developed a unique synthesis in his own compositions. He will lead seminars using Turkish instruments in contemporary idioms, and discuss methods of notation and orchestration for Turkish instruments including, ney, G clarinet saz/baglama, and ethnic percussion. Attendance to the Free Improvisation classes, Anatolian and Balkan Songsworkshop and to all parallel KK rehearsals/concerts will be included in the price of the course. All students accepted full-time will have a 2 to 10 minute piece performed and recorded during the workshop. Solo pieces and small ensemble works for the following instrumentation: Strings (no bass), oboe, clarinet, piano, percussion will be considered. New scores or pieces in progress can be submitted at the festival for readings. Course fee for passive students: 30 TL / 15 EU per day.